One of the first Bible stories I ever remembered was that of Joseph and his brothers. Joseph was a dreamer and had the gift to interpret his dreams. In two separate instances Joseph dreamed that his brothers and father would bow down to him in servitude. When he shared his dream with his brothers, they were furious. Howbeit they didn’t have much love for him in the first place and when he came boasting about his dream to them, this only added fuel to the fire. They devised a plan to ensure that his dream would not come true. It was bad enough that he was their Father’s favorite and a tattle tell, now he was trying to say that they were going to have to serve him as well. They knew how to stop this dreamer from dreaming and stop the madness. So they threw him in a pit and ultimately sold him into slavery. Eventually he found himself in prison. Unbeknownst to him this was his destiny in fulfillment of the dreams on his way to the palace. Everybody that you share your dreams with will not be happy about your dreams. 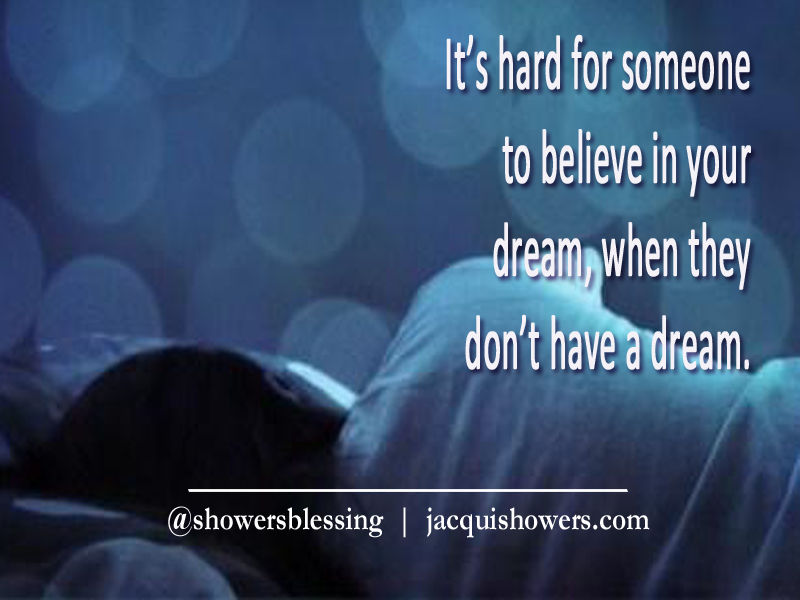 You have to be careful whom you share your dreams. Everybody is not rooting for you to be successful. Believe it or not, even in your family, people don’t want you to succeed. Guard your dreams. When people don’t have dreams, they are not going to support your dreams. It is hard for someone to be excited about your success when they don’t have anything to be excited about themselves. In essence, they refuse to dream and even more, they refuse to live their dreams. They will do whatever it takes to prevent you from living yours as well. Misery loves company. Don’t accept the invitation to the party. No one can prevent your dream from happening. Yes, you will have those who would have you believe that your dream will never happen. The only way your dream will not happen is because you sabotage it—that includes giving someone permission to stop you from pursuing your dreams. For your dreams to become a reality you will have to walk away from dream busters. There are people who don’t want your dream to come true. Let them go! In essence, walk away from those unhealthy alliances. When the relationship is severed, by your doing or theirs, don’t pine over them. Definitely don’t rekindle it. They never had your best interest at heart anyway. Release them and be set free to passionately live your dreams. Celebrate the dream busters. The very people who think they have the power to stop your dream from happening, will be the very ones who catapult you down the path to fulfillment of your dream. Instead of hating on them, celebrate them for moving you in the right direction. Never lose focus of your dreams. It may appear that your dreams will not come true, but keep the faith. Just because you may have some pit experiences along the way, doesn’t mean that your dream has died. The dream is given, but the process to the fulfillment of the dream is not. Stay focused and committed in the process. Never give up and stop believing in your dreams. Your relentless determination will override any attempts to thwart your dream from happening. Hold fast to your dreams. Never give up hope regardless of the circumstances or others perceived power over the future of your dreams. It will happen as long as you stay steadfast and committed to the dream. Posted on April 8, 2015, in Showers' Blessing Inspirations and tagged coaching, dream-busters, dreams, family, gift-of-His-presence, jacqui-showers, Mentor-Empowerment-Institute, mentoring, prayer, purpose, pursue-your-passion, Showers-Blessing', The-Me-Place, the-showers-group-ministries, transformed-mind. Bookmark the permalink. Leave a comment.